There are an overwhelming number of interconnected hiking trails in the Western Mountain pantheon, and while they are all pleasant, the mostly forested scenery is fairly mellow. The Razorback Trail, however, is one of the more stunning stretches of trail in this part of "the quiet side." Following an exposed granite ridgeline along the southwest side of Mansell Mountain, the Razorback Trail offers unhindered views as you hike up the interesting rock formations reminiscent of the spine of a gigantic dinosaur. 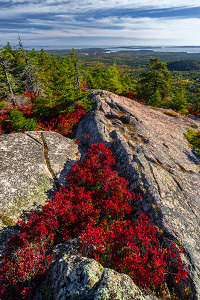 While the Razorback Trail doesn't go directly to the top of any named peak, it is easy to do short side hikes to the summits of Mansell Mountain, Knight Nubble, and Bernard Mountain. Rating: Fairly strenuous day hike. Elevation Change: 680-ft elevation gain (plus 150-ft gain for Mansell Mountain and 290-ft gain for Knight Nubble). To get to the Gilley Field Trailhead, from Route 102 just north of Southwest Harbor, drive west on Seal Cove Road for roughly 1.8 miles. (As the road enters NPS land, it will become a rugged narrow dirt road.) Turn right (north) on a .5 mile connector road, then right again (east) onto Western Mountain Road. Follow it north-northeast to the isolated Gilley Trailhead. From the parking area, you will see the trailhead markers for the Mansell Mountain Trail and the Gilley Trail; take the Gilley Trail west into the forest. After only .1 miles, turn right (north) onto the Razorback Trail. The hike starts to get a bit strenuous as the trail heads up the steep densely-forested slopes of Mansell Mountain. Soon enough, you will clear the trees to be hiking up the spine of a beautiful ridgeline of exposed granite; this is one of the rare sections of bare mountain west of Long Pond. Be sure to look behind you to catch the wonderful views of Bernard Mountain to the west and the Atlantic Ocean to the south. The Razorback Trail doesn't actually lead directly to the summit of Mansell Mountain, but at the top of the ridgeline is a junction with a connector trail to the Mansell Mountain Trail. 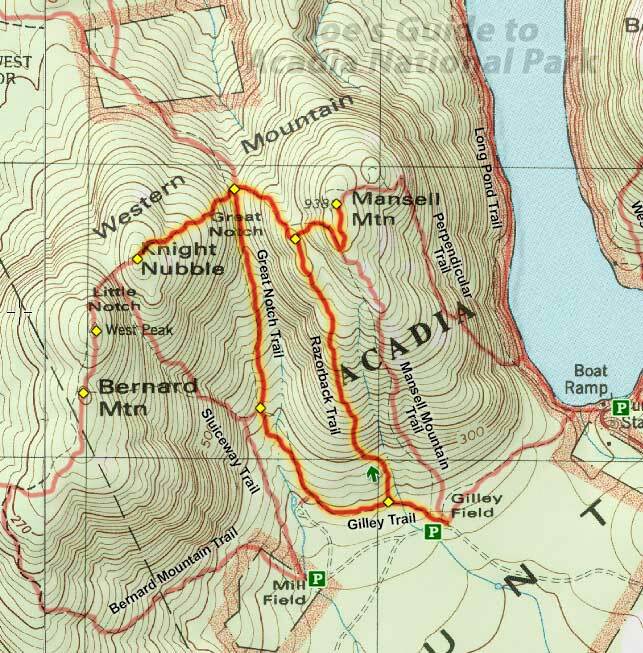 If you are into tagging all of the peaks of Acadia, take the 30-minute or so side trip along the connector trail, then hike the Mansell Mountain Trail north for .2 miles to tag the Mansell Mountain summit marker. The highpoint is forested and doesn't have a view, so it's a bit anti-climactic. Returning to the Razorback Trail, follow the ridgeline as it descends northwest away from Mansell Mountain; this short section of trail has some really beautiful rock formations. Soon enough the trail is back down under the trees at a spot known as the Great Notch--the forested valley in between Mansell Mountain and Knight Nubble where several trails meet. If you want to take a second side trip to tag Knight Nubble, this one takes a bit more effort and an extra hour or so. 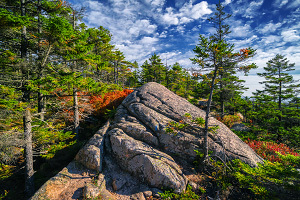 Follow the Bernard Mountain Trail as it heads up the steep east face of Knight Nubble. The summit of Knight Nubble is also forested with no big view, but there is an overlook halfway up the mountain that offers a pretty good view. I love the Razorback Trail! It is one of the most scenic trails among the maze of trails that wander up and around Western Mountain. While I like going up the Razorback Trail and coming back down the Great Notch Trail, there are many alternatives for different and longer routes. And if you have time for only one hike in this area, consider hiking up the Perpendicular Trail and descending the Razorback Trail (even though you will miss one of the short and beautiful sections of the Razorback Trail).